In September 2017, Steve Arnold, owner of Yarmouth Boat Yard on Casco Bay in Maine and Moose Landing Marina in the Sebago Lake area, signed with Freedom Boat Club to expand his business. He is now opening a third club membership at a third marina location, having quickly grown the boat club and his other profit centers – dealership, service facility and boat rentals. “Seeking a richer quality of life,” Arnold transitioned from a successful career in finance to marina ownership. He purchased Yarmouth Boat Yard 16 years ago, growing it into the marina it is today. Yarmouth Boat Yard is now a successful and busy full-service marina with 105 deep water slips, off-site indoor heated storage, on-site storage, a large service building and dealership that sells a wide array of boat lines including SeaFox, Pursuit, Cutwater, Eastern, Seaway and others. The marina also includes a brokerage and full-service repair facilities. Arnold expanded his marina operations six years ago with the acquisition of Moose Landing Marina located on Brandy Pond in Naples. It has access to 44 miles of boating on Maine’s second largest lake, a very popular vacation destination. The marina boasts a large boat rental fleet, and it also manages a rental fleet at Point Sebago. Presently the fleet has 24 rental boats at Point Sebago and 34 at Moose Landing Marina. The marina completed a large $2 million expansion two years ago, adding 60,000 square feet of indoor storage. Both heated and cold were added with a new service building and a cruiser building for bigger boats. 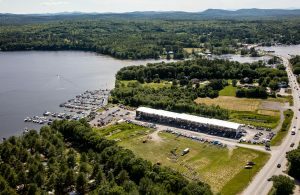 Residing on 13 acres on the lake with 250 slips, the marina has a huge presence in Maine’s lake district. 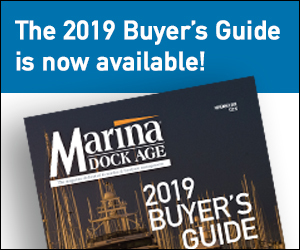 Apart from its storage and repair services, the marina also sells the Godfrey line of boats, Ranger Tugs, Hurricane Boats and Regal. Arnold purchased Moose Landing Marina in 2013. The marina has a strong boat rental business, which continues to thrive with the boat club. Arnold had researched boat clubs for some time and believed it would be complimentary of his current business. He had been looking into Freedom Boat Club for about five years and seriously started investigating the business potential of the club about three years ago. Arnold said that he saw people buying expensive boats only to sell them a year or two later because they didn’t use the boat enough. Arnold has witnessed “people getting into boating for the first time and people getting out of boating and everything in between.” He believed the Freedom Boat Club model would work very well at his marinas and beyond. It offered, he said, “the ability to have a boat club that offers a one-time entry fee and then monthly fees.” He explained that compared to buying a new boat, the boat club costs half of what a new boat would cost the first year, and it goes down from there. “The entry fee is just in the first year and from then on it is only monthly fees,” Arnold said. The business budgeted for 33 members between the two marinas in the first year and ended up with 68. Arnold said the first year was hard work and capital intensive. Challenges arose as the memberships grew faster than expected and the budgeted number of four boats had to grow to six at the one marina. Fortunately, Arnold had boats available from his dealership at the marina and was able to add the needed boats to the exiting fleet of SeaFox boats. Considering the ratio of boats to members is an important factor in assuring all members will have good access to boats when desired. Arnold explained that in Florida for example, the ratio is 10 to 1 because of year-round boating. In this area of Maine, assuming four rolling reservations at the time, he was able to keep a 7 to 7 ½ ratio of members to boat and did not have reservation availability issues. He also said that boat club members understand that they can’t call on a Friday and expect a boat Saturday. Generally, the marina is booking out a week to two weeks in advance. Boat club memberships did not affect boat sales at the marina. Arnold said that he had boaters who left boating and were unlikely to purchase a new boat from him get back into boating though a boat club membership. The elimination of storage and service costs along with the hassle free enjoyment of the club’s fleet brought them back, he said. When a member books a boat for an outing at one of the marinas, they are greeted at the parking lot by a marina representative who helps them load up and runs through a checklist onboard to make sure everything is as it should be before they set off for the day. Upon return they are assisted at the dock. Members are responsible for fuel costs but it’s virtually hassle-free for boaters. Arnold said that the Freedom Boat Club has actually created boat sales for the marina. Boaters that are not sure about investing in a new boat can be introduced to the lifestyle through a membership. Arnold has had customers that purchase a boat at the end of a year-long boat club membership. The rising cost of boat ownership can exclude a lot of people who would otherwise enjoy time on the water. Freedom Boat Club offers an affordable option to these people and brings in customers to the marinas that would otherwise not be there. With a large and successful rental operation at his Moose Landing Marina opening a Freedom Boat Club at the marina did not affect the rental business in the least. His boat club customers are different from his rental customers. Vacationers are purchasing the rentals for a day or week at a time depending on how long they were in the area on vacation. Club members tend to be customers who live nearby, have full-time or vacation residences in the area and would spend more time on the water than an average renter. Tracy Coughlin, marketing director for Yarmouth Boat Yard, Moose Landing Marina and Freedom Boat Club of Maine, explained that opening the club at the marina drew in customers who did not want to invest in a boat or worry about a boat when they were not there, but they would spend enough time on the lake to justify a club membership. It is clear from the success of Arnold’s Freedom Boat Club locations, the growing trend in boating has brought in new customers to his facilities and opens up the world of boating to a group that might not otherwise have been afloat enjoying all that the water of Maine has to offer.